Homeowners do not pay a lot of attention when it comes to selecting the bathroom vanity top. Then end up with the wrong vanity material and regret later. Bathroom vanity top is as much as important as kitchen countertops. It is important to pay attention over material, style, design and color of the vanity top before installing it on your bathroom vanity. One small mistake can ruin the overall look and feel of your beautiful bathroom. –Not paying attention over size: Bathroom vanity size should be an important consideration while purchasing the one. If size is not chosen properly, it will look too big in the bathroom and cover a lot of area. Plus, it is create inconvenience in using the bathroom vanity in the small area. –Not paying attention over bathroom vanity top shape: Bathroom vanity top shape is an important consideration. You should pay special attention over the vanity top shape. It is possible to provide a touch of style by choosing a stylish shape. Modern vanity tops comes in a lot of stylish shapes. -Selecting random color: The vanity top should match with the entire decor of your bathroom. If you install vanity top of any random color, it will look odd. Modern countertops are available in variety of colors and textures. -Selecting the wrong countertop material: Bathroom vanity top material is the most important thing that you should consider while selecting the vanity top material. 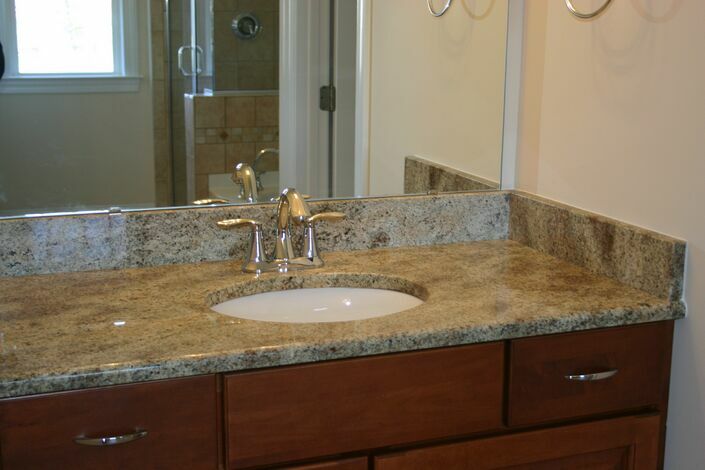 The vanity tops are available in a lot of materials such as –granite, marble, quartz, silestone, tile etc. Different countertop materials have different qualities. Some materials are heat resistant, some are scratch resistant, some are stain resistant and so on. The countertop material, you should select should be capable of coping up with the day to day activities of your bathroom. -Purchasing overpriced countertop: A lot of contractors and companies are selling bathroom vanity tops at different prices. Along with the quality, you need to consider the price of the countertop before investing your fortune. Compare the price of the same material with different bathroom vanity top contractors, and then finalize the one who is offering the best quality at the best price. It is possible to save a lot of money by choosing the right contractor. Kitchen countertops are one of the most ignored parts of the kitchens –it bears daily wear and tear, it gets dirty, and it abides load and heat. Still kitchen owners don’t play attention over the maintenance and care of the kitchen countertops. Be it restaurant kitchen, be it bakery kitchen or be it restaurant kitchen, the countertop has its role to play in the kitchen. 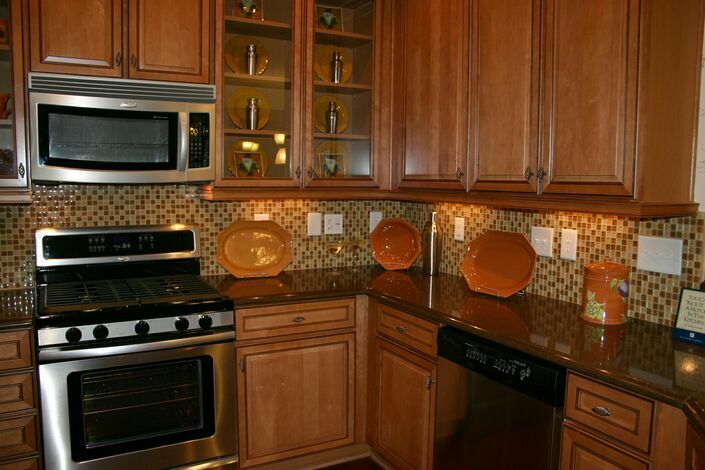 The role of kitchen countertop varies kitchen to kitchen. It is very much important to treat the countertop right to enjoy years of services. In commercial kitchens, countertops remain under constant pressure. More than one person uses the counter for different tasks at one time. The countertop is exposed to more heat, more load, more moisture and more scratches in the commercial kitchens. 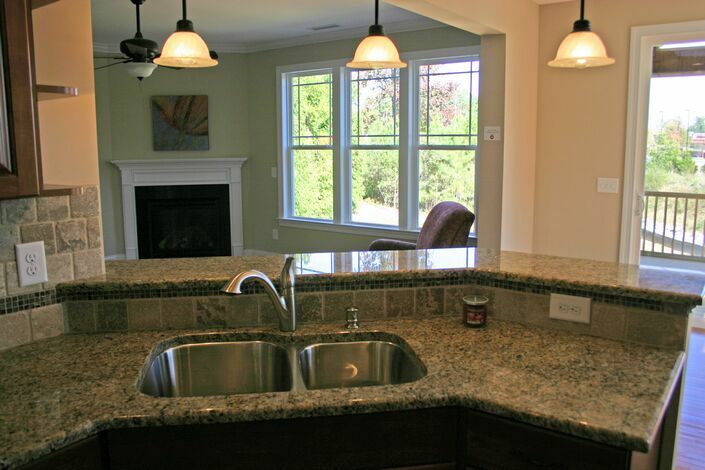 This is the reason why stronger countertops are recommended for the commercial kitchen, such as granite and quartz. Kitchen countertop selection: Different kitchens have different requirements. The countertop material should be selected by analyzing the needs and requirements of the kitchens. Kitchen countertop installation: No matter which countertop material you choose for your kitchen, the countertop should be installed properly. 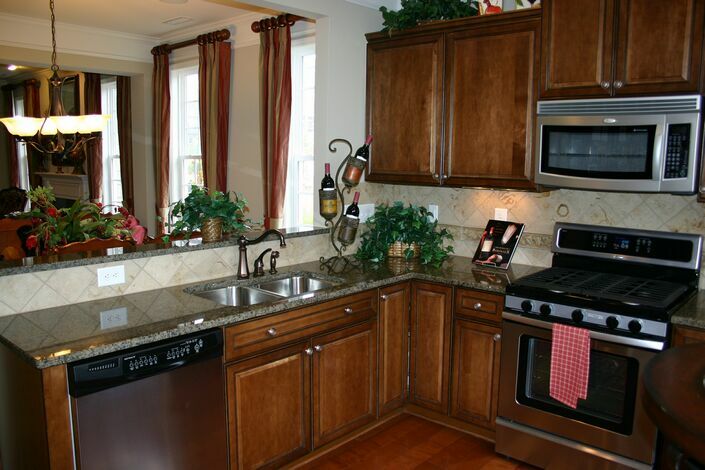 Kitchen countertop cleaning: Kitchen countertops must be cleaned on the regular basis. Generally, countertops are easy to clean. You just need wet cloth to get rid of the food spills. Kitchen countertop sealing: Some countertop materials are porous, hence they are required to be sealed. It is important to hire the countertop contractor and schedule the sealing. Once unknown, quartz is a popular name now in kitchen remodelling market. It has become one of the popular choices for kitchen countertops competing natural stone countertops. Quartz is a hard and manmade material, which is good for kitchens and bathrooms. It somewhat looks like natural stone and bound well with resins. Since this countertop does not require sealing, it is preferred by many homeowners over natural stone countertops, such as marble and granite. Quartz is an engineered stone. It has luster, hardness and translucence of its own. Quartz is 93 % made from stone while it contains 7% resins and polyesters. This makes it look different from natural stone countertops. This countertop contains remains of granite, marble, glasses, mirrors, ceramics and other industrial wastes. That’s how quartz countertops get their unique texture. Great looks: Quartz countertops look amazingly beautiful. 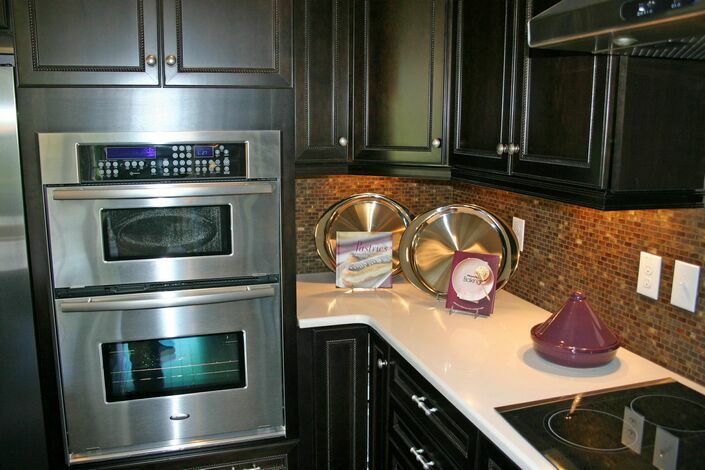 Quartz countertops are available in various colors and textures. You can easily match your countertop with cabinets and floors. It increases the value and beauty of place where it is installed. Hardness: Quartz countertops are quite hard. They are good for both kitchen and bathroom. They are largely made from minerals, and these minerals define their hardness. Quartz countertop does not chip or crack easily. You can put hot pat or flattening iron on the countertop. This countertop can provide you years of service without any trouble. A few imperfections: Since quartz is a manmade material, which contains some percentage of industrial waste, it has some imperfections. The slab of quartz countertop does not look as perfect as granite and marble slabs. Price: Even though quartz countertops are not as perfect as granite countertops, they are equally expensive. There is no significant amount of different between the price of granite countertop and quartz countertops. Solid surface is a great manmade countertop material. This material is combination of acrylic and polyester. The solid surface countertops can be used in kitchens, bathrooms, decks and even in commercial kitchens. This surface is durable and easy to maintain. It is capable of withstanding daily wear and tear with grace. There are plenty of reasons to opt for the solid surface countertops over convectional countertop surfaces, such as marble, granite, quartz and tiles. Solid surface countertops are gaining popularity these days among interior decoration experts. In fact, several home improvement magazines have featured the solid surface countertops, and highly recommended for kitchens and bathrooms. These countertops are capable of transforming any mediocre space into plush area. It brightens up the aura of the room where it is installed. Variety: Since solid surface countertops are manufactured in factories, they are available in variety of designs. You can find plenty of colors and textures in the solid surface countertops. You can even finish it with polished or matte. Beauty: Solid surface countertops look incredibly beautiful in kitchens. Their presence can actually increase the value of your kitchen. Since they are available in plenty of colors, you can find a perfectly matching countertop to complement your kitchen décor. Durability: Solid surface countertops are engineered to bear the load and stress of busy kitchens. They are highly durable and strong. You can enjoy beauty and strength of this countertop surface for a long period of time. Low-maintenance: Solid surface countertops do not require much maintenance. They don’t get stained easily. Moreover, you can easily clean them using soap water and cloth. Hygienic surface: Solid surface do not harbor bacteria. This makes them apt choice for kitchen countertops as well as bathroom countertops. You can enjoy this aseptically clean surface in both kitchen and bathroom. Repair: Unlike natural stone countertop surfaces, solid surface countertops can be repaired if they are broken. You can hire a contractor and get your countertop repaired. 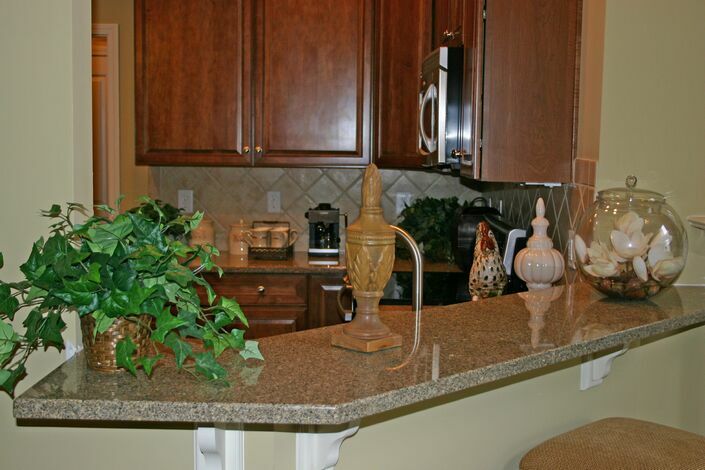 Cost: In terms of cost, solid surface countertops are cheaper than natural stone countertops. This countertop is a great investment as well.